I’m ashamed to admit that it took chaperoning a fifth grade class trip to the Rockville Memorial Library for me to remember how much I love the library. 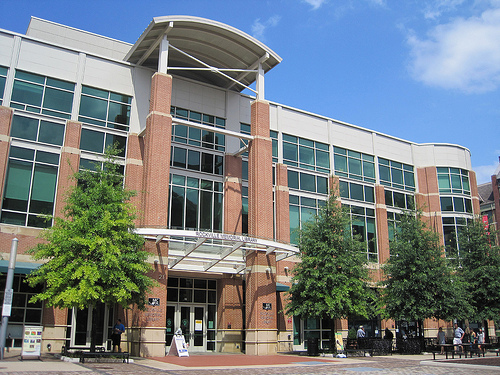 The old Rockville library, the site of the new District courthouse, was a huge part of my childhood. The stairs in the building were open, and as a little kid I was terrified of falling through the spaces between them. But that didn’t prevent me from looking forward to leaving with a bag full of books, feeling rich. Throughout my teens, the library was where I did my research projects—searching through the microfiche and encyclopedias—and whispered with my friends during group projects. But ever since college, with the explosion of bookstores, coffee shops, and the internet, I slowly minimized the role of the library in my life. Even after motherhood, although my older son and I would sometimes walk to the same Rockville library from our home, we still ended up in the Barnes and Noble kids’ section more often. Looking back, Barnes and Noble made it so easy—the kids loved playing with the train table, I could sit with a latte and chat with friends, and we all enjoyed story time. I’d usually let the kids buy a small book to take home, but realize now that they spent most of their time fixated on the one book they wanted. It wasn’t the same experience as the library, where there is no “you can’t have that,” or “put it back.” My mother never groaned when I had a stack of books too heavy for me to carry on my own. I know now that it delighted her to know that I would read them all. I cried when I saw the old library building get torn down. It felt like a part of me was being destroyed, even though the new Rockville Memorial Library was open. The new library is a breathtaking building, a truly lovely space to be in that I remember marveling over when it first opened five years ago. But I’ve only made sporadic visits since. During my son’s fieldtrip, while the kids looked up information for their research projects, I leisurely browsed the stacks and ended up with a pile of books I didn’t intend for myself. My son left saying, “I love the library,” and I decided that we need to make regular visits to build new memories in this special place together. I want my kids to understand what it’s like to feel rich in books, even when you have to give them back.